Slow. Too much popping up and down. Hard to kick right. But did you also know that it burns more calories than the butterfly? And that, if done right, it takes more strength than any other stroke? So next time you use the breaststroke to recover from your freestyle workout, think again…you may want to spend some time working on these tips instead! Yes, this is the obvious first step. But it’s also one of the most important. You’re moving fastest in the water right after you dive. You should do everything you can to preserve momentum. Aim for little to no splash. Enter the water through one hole (streamline your body). Extend your arms and legs, tucking your head between your shoulders and looking down. If you execute a good dive, that will add 6 feet to your glide. That’s 2 meters that you get for free. No extra work or energy required! Once you’ve glided as far as you can without losing much momentum, you’re probably near the surface. It’s time to pull! Shrug your shoulders up and extend your arms up and out, palms facing away. Shrugging your shoulders keeps them close to your body, decreasing drag. Now, with palms facing in, circle down and bring your arms back to your chest. Once your hands reach your chest, quickly extend them straight in front and try to touch your elbows together. The insweep is your biggest powerhouse, so make it count! There’s less drag underwater than right at the surface, so try to keep your hands underwater for the whole pull. You are required to breathe once per stroke, or you’ll be disqualified. That makes it an integral component of each pull. 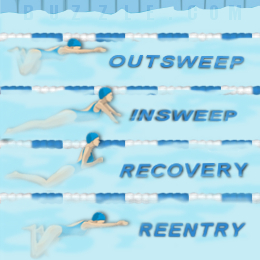 The best time to breathe is right after completing the insweep, during the “recovery” phase. It’s called recovery, but there really should be no pause in your movement! After sweeping down and up with your arms, your head will naturally pop out of the water as your arms extend forward. Perfect, it’s time to take a breath! Don’t force your head up to breathe since it’s already where it needs to be. This will throw you off-balance and cause unnecessary and unwanted drag! The breaststroke “frog” kick takes time to master, but it’s worth putting in the effort! Bend your knees and keep your ankles flexed. As you begin the kick, turn your toes outward and kick out and down. You should be making a circle with your feet, toes leading the way. As you make your circle, extend your legs so you make as large an arc as you can. End with your legs fully extended, toes pointed to the bottom of the pool and ankles touching. That’s all there is to the kick! The hardest part is making sure your toes point out the entire time. And then there’s the timing of putting it all together….. Timing is the key to a great breaststroke. Begin bending your knees for the kick as you enter recovery, when you're about to extend your arms. This sets you up nicely for the kick, which should happen as soon as your arms are extended. Once the kick is complete and your legs are almost fully extended, you can begin your pull. In other words….stroke with your arms when your legs are streamlined, and kick when your arms are streamlined. That way you have the least amount of resistance from the rest of your body while each muscle group is working. The key to swimming fast is NOT swimming faster. It’s reducing drag. The faster you swim with bad technique, the more resistance will hit you. You won’t get anywhere. 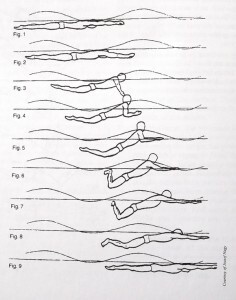 But if you decrease your resistance by improving technique and body position, the water will part in front of you like the Red Sea. Put in the work to improve your stroke and even slight changes will show vast improvements in time and energy spent in the water. Why is breaststroke your favorite stroke? Or why do you not like it? Share your reasons below!